Before the time of Christ and the Romans, the area around Trier was occupied by a Celtic tribe known as the Treveri. Two thousand years ago the Romans arrived. Some time after the Romans the Holy Roman Empire and Catholicism came. From about 1000 A.D. to 1794 the spiritual as well as the temporal head of the land along the Mosel River from Trier to Koblenz was the Archbishop of Trier. The Archbishop was also a Prince of the Holy Roman Empire and as such had voting power in the governance of the empire. The originals of the Church and Tax Records I used in my research can be found in Trier archives. Trier, sometimes called Treves, is thought to be the oldest town in Germany. It was founded about 16 B.C. by Caesar Augustus and called Augusta Treverorum. Trier contains several Roman structures including the Roman Bridge across the Mosel River built about the 2nd Century. Trier's Catholic Cathedral contains Christ's robe for which the Roman soldiers "cast lots". Of course the most important landmark in the area is the Mosel River (German spelling). 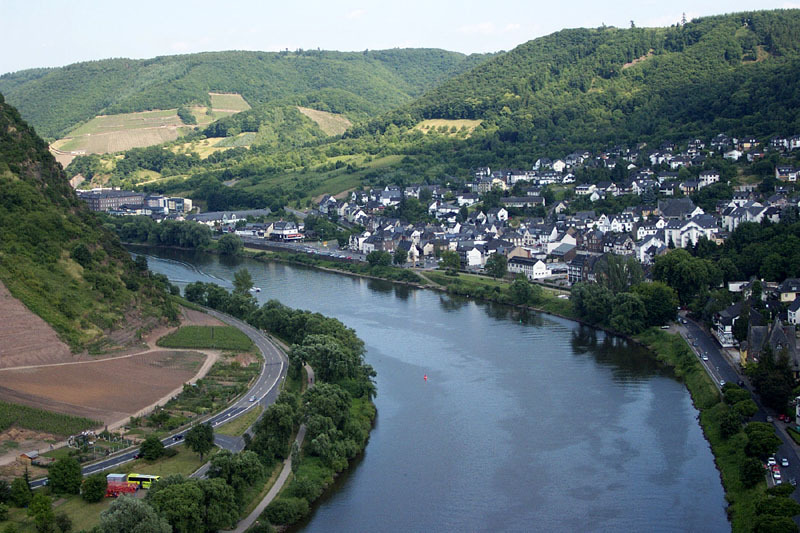 The river rises in France, flows past Luxembourg, and after entering Germany continues on past Trier and Cochem and empties into the Rhine River at Koblenz. The distance by river from Trier to Koblenz is about 118 miles. Measured in a straight line the distance from Trier to Koblenz is only about 60 miles. The distance is almost twice as long by water because of the many loops and bends in the river. The steep slate slopes along the river are testaments to the Mosel's power. Death records also bear witness to the river's strength with "submersus" or "aqua suffocatus" as the cause of death on numerous death record entries. My ancestor Richard Heuschen drowned near Koblenz on February 24, 1675. About 36 miles as the crow flies from Trier lies the town from whence our family name, Cochem is derived. Cochem is an ancient town and its name is derived from the Latin "villa cuchemia". At Koblenz the Mosel ends when it merges with the Rhine River. Hence Koblenz's Roman name "confluentes". An Archbishop of the Catholic Church ruled the area around the Mosel, so our ancestors were spared the religious wars that came after Martin Luther (1483-1546). In other areas of Germany it was often necessary to move in order to practice the religion of your choice. Though the land along the Mosel remained mainly Roman Catholic there were a few Protestants and Jews. 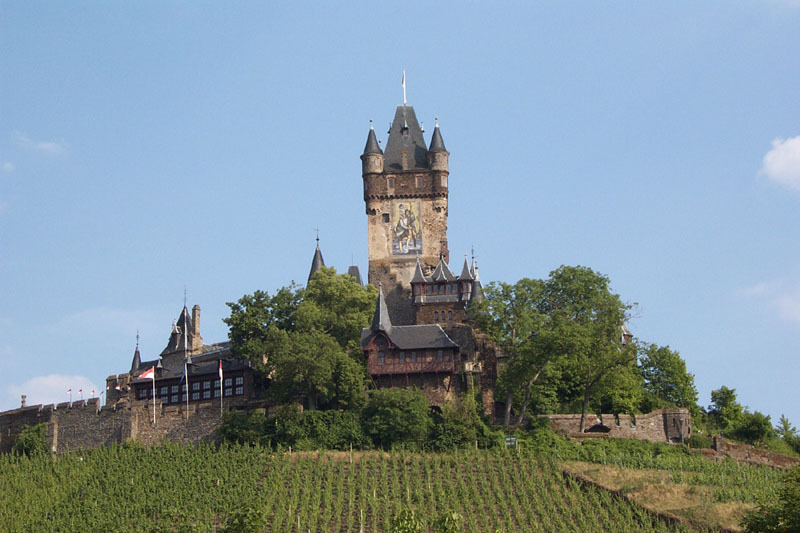 This is not to say the Mosel region was spared military occupation. The French invaded this area on numerous occasions. I found no record that our ancestors, or the villages described in the following pages were actually involved in any local battles. However our ancestors were probably dislocated or suffered from diseases brought by invading troops. 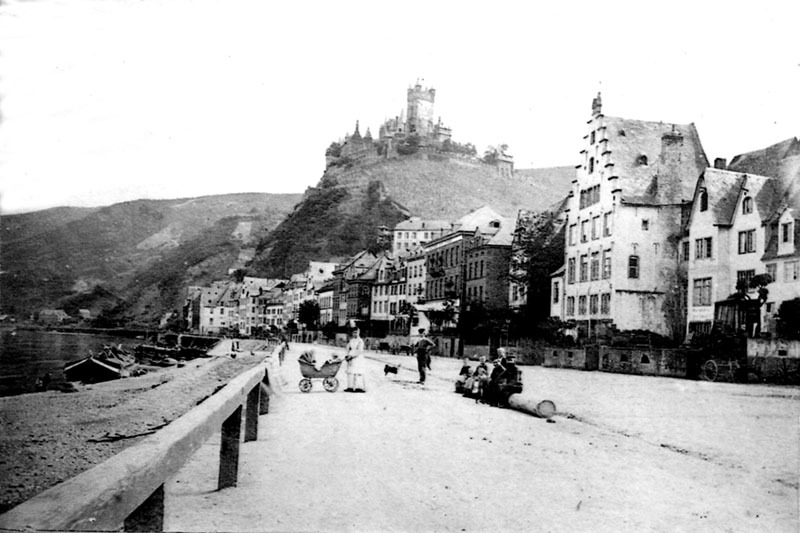 We will probably never know if any of our direct ancestors lived in Cochem when it was sacked and burned in 1689 because the Cochem Church records were destroyed in the conflagration. The principle industry along the Mosel River is the growing of grapes and the production of wine. According to Kerry Brady Stewart in her book, A Travellers Wine Guide to Germany: "Roman conquerors were the first to cultivate vineyards systematically. During their 450 years of supremacy, the Romans developed viticulture and wine shipping into what remains the Mosel's most important industry, for the vine is still the only crop to flourish on the steep slate slopes.....Another feature of the landscape dating from Roman times is the use of single stakes to support vines. This method...is seldom seen outside the Mosel....the canes of each vine are bowed into a heart shape and tied to an individual stake." With a few exceptions most of our ancestors were involved in wine production, either as vintners, grape growers, or as managers of large estates which were engaged in grape growing and wine production. However since each village was largely self-sufficient, many of our male ancestors also practiced a trade. Each village often had their own shoemaker, mason, cooper, teacher, etc. Everyone worked, men as well as women. Before marriage women often worked as domestic help in someone else's household. After marriage many women undoubtedly worked along side their husbands in the wine production industry. Henry Cochems wife and daughter worked with him as locksmiths. Working was essential for both sexes in order to save enough money to marry and raise a family. It is not uncommon to find a marriage a few months after the death of a parent. Perhaps the inheritance was the needed financial impetus for marriage. Couples might know each other for many years before they were financially prepared to marry. The average age for marriage was between 25 and 30 years old. From what I can determine education was available to boys as well as girls and each village usually had their own teacher. Most students at least learned to read and write. At least one of my ancestors, Nicolas Steuer, was a ludimagister (school teacher) at the end of the 17th Century. The following is a synopsis of village political life for Henry's ancestors as told in the Lutz Family Book by Michael Frauenberger, Norbert Pies and Eike Pies and translated from the German by Frederick Nicholson. Since ancient times, rural communities in the Hunsruck have chosen a village elder who as Mayor (Schultheis/Burgermeister) managed the affairs of the community and along with the Jurors (Schoffen/Scabini) were called in cases of controversy to settle them. The Burgermeister was democratically chosen by the village. In contrast the Vogt was appointed by the current ruler and he therefore represented the interests of his lord in the area. This appointed Vogt, together with the Kellner (tax collector) determined the tithes and the rents for manorial estates. The Church Councilmen (Sendschoffen/Synodali) were elected by the church membership and confirmed by the priest. It was their duty to care for the poor and needy in the community and to determine the identity of the father of an illegitimate child. From their ranks a Vorsitzenden, (President or Chairman) was chosen, in olden times often referred to as a church-knight. These vorsitzend audited the books of the church and rendered an account of them. Besides their church-justice and social duties, they decided on the giving of credit from the capital funds of the church and necessary renovations and construction projects involving the church buildings. I have not been able to determine when the above form of village government ended. However Valwig church records in 1811, 1812 and 1818 listed my ancestor Theodor Goebel as a Synodolis (Church Councilman) and referred to him as a Scabinus (Jurist) in 1815. I do not know when last name Cochems was first used. I assume its usage referred to someone who had lived in the town of Cochem. Many last names in this area along the Mosel River are derived from place names. In German records the name Cochems is usually spelled with a "C". Henry Cochems (1807-1881) signed his name as Henry Kochems on official documents in 1831, 1840 and 1851. In 1862 Henry signed his last name with a "C" or Cochems. All of Henry's descendents in the United States spelled their name Cochems. Today in the town of Cochem our distant Cochems cousins spell their last name Cochems. However there are numerous people in the United States who have the last name Kochems. It is possible that they are our distant cousins but are using the variant spelling of Kochems with a "K".